Create an intuitive all-in-one kiosk system by combining this DS-Tmini Kiosk Order Terminal with one or two DS620A, DS820, DS80, DS-RX1, or DS80DX dye sublimation printers from DNP. The DS-Tmini transforms the printers into a full-fledged ordering system that can be quickly set up on location for customers. Making operation intuitive is the use of a large 10.1" color touchscreen with a resolution of 1200 x 800. Also, it comes with a router that allows it to be networked and then work with the DNP mobile app for iOS and Android devices. 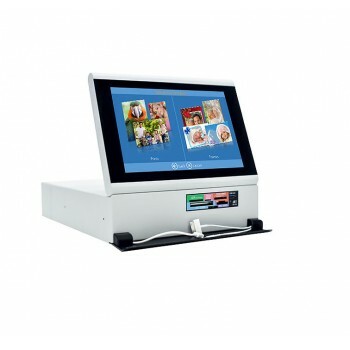 The kiosk comes equipped with multiple interfaces for printing from a variety of devices. This includes a card reader with inputs for SD, microSD, CompactFlash, Memory Stick, Memory Stick Micro, and xD as well as four USB ports that can accept connections from smartphones and other devices. A smartphone holder is conveniently built into the system as well, to account for customers working directly from their phone.